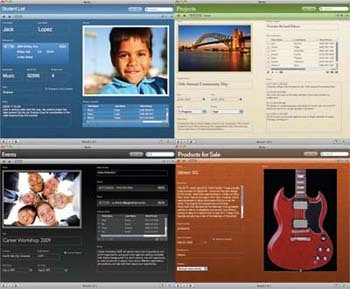 Meet Bento 3 for Mac, the breakthrough new version of the wildly popular personal database from FileMaker that’s as easy to use as your Mac. Organize contacts, track projects, plan events and more – all in one place. 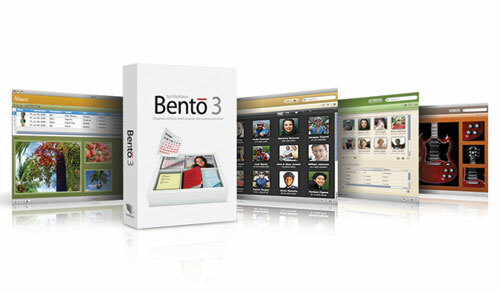 Bento 3 now includes iPhoto integration, security options, multi-user sharing, and much more! 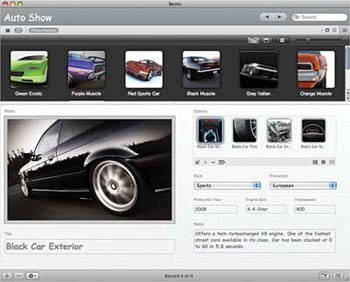 Choose from 35 pre-designed templates included with Bento, download and import templates from others who share your passion, or design your own custom forms using beautiful themes designed by Mac artists. Bento links directly to the Address Book and iCal information you already have on your Mac to display your contacts and calendars in new and exciting ways. Add places to store important details about each person, event, or task, including related files, photos, and emails. Plus, changes you make in Bento are reflected in Address Book and iCal so your MobileMe account, your iPhone, and your iPod touch will be in sync. Now you can easily share your contact lists, project plans, event details, and other Bento libraries with up to 5 Bento users on your local area network. Choose which libraries you want to share, and if you want to allow adding, deleting, and updating of information, or limit access to viewing only. Even add a password if you like. 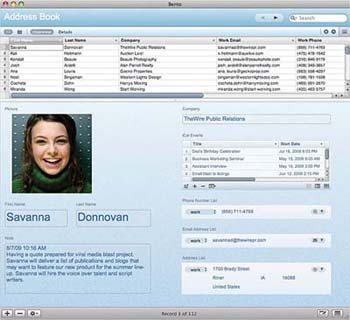 Now your family and friends, classmates, and coworkers will always be informed and up to date.Meet Bento 3 for Mac, the breakthrough new version of the wildly popular personal database from FileMaker that’s as easy to use as your Mac. Organize contacts, track projects, plan events and more–all in one place. 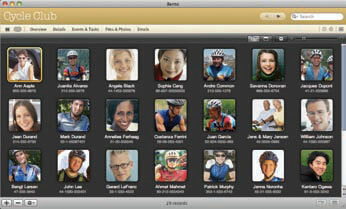 Bento 3 now includes iPhoto integration, security options, multi-user sharing, and much more! Choose from 35 pre-designed templates included with Bento, download and import templates from others who share your passion, or design your own custom forms using beautiful themes designed by Mac artists. Bento links directly to the Address Book and iCal information you already have on your Mac to display your contacts and calendars in new and exciting ways. Add places to store important details about each person, event, or task, including related files, photos, and emails. Plus, changes you make in Bento are reflected in Address Book and iCal so your MobileMe account, your iPhone, and your iPod touch will be in sync. Now you can easily share your contact lists, project plans, event details, and other Bento libraries with up to 5 Bento users on your local area network. Choose which libraries you want to share, and if you want to allow adding, deleting, and updating of information, or limit access to viewing only. Even add a password if you like. Now your family and friends, classmates, and coworkers will always be informed and up to date. 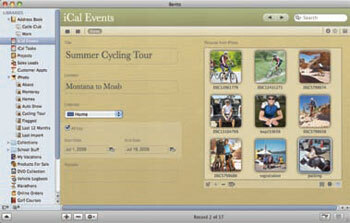 View your iPhoto information inside Bento in the new Grid view, Table view, Form view or Split view. 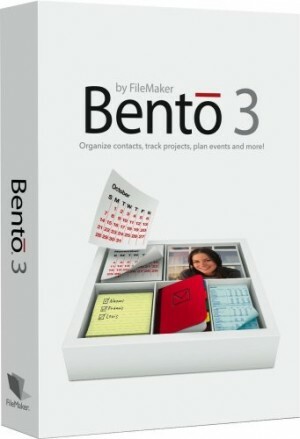 Link photos to contacts, projects, events or other data stored in Bento. View any library in the new Grid view to show a grid of pictures and forms for a more visual approach to your information. Store more info about photos and link them to contacts, projects, events, and other information stored in Bento. In addition to Table view, Form view, and Split view, you can now see your images and forms in Grid view for a more visual approach to your information. Protect your sensitive data using encrypted fields and password protection. Great for web site logins and banking details. Share your Bento libraries with up to 5 other Bento users on your wired or wireless local area network. Ideal for sharing contact lists, project plans, and event details with family, friends, classmates and coworkers. Displays thumbnail images of related data instead of just text. For example, link a list of guests to an event–and see a picture of each person invited in the related data field. Displays thumbnail images of related file instead of just text. For example, link a list of files to any record and see the first page of PDF file or a mini version of jpg images in the File list. Add a freeform table to your forms. Great for creating a quick to do list or shopping list–and for tracking gifts received at parties and weddings. Save space in your Libraries pane by grouping like libraries in a single folder. Libraries contained in the folder can also be exported as a group. Send one email to multiple recipients through Apple Mail with a few clicks. Thanks to the addition of ten ready-to-use templates, there are now a total of 35 templates to choose from. See all your albums listed in the Bento Libraries pane automatically–no importing required. Add additional fields and forms to store more information about your photos beyond what iPhoto stores. Note: Photos and associated data from iPhoto can only be viewed from within Bento and cannot be edited. However, you can add new fields to your Bento forms to store more data about your photos, but it will not appear in iPhoto. Customize the Grid view to display additional information under each thumbnail that is most relevant to you, like phone numbers or email addresses for all your contacts. Create and view your own customized thumbnail forms. For example, say you have 40 products that you’re selling. You could create a form where you have an image of the product next to the part number and price to see multiple product “cards” together on one screen. See thumbnail images of media in your Related data fields (formerly called the Related records lists). For example, you can link a list of guests to an event–and see a picture of each person invited on the event record. See a thumbnail image of each document in the File List instead of seeing a list of text containing names of files. For example, you can see the first page of PDF file or a mini version of jpg images. See mini versions of pictures, movies or PDFs stored in a media field when you’re in Table view. Use Quick Look to view the media cell contents while in Table view. Bento links directly to the Address Book and iCal information you already have on your Mac to display your contacts and calendars in new and exciting ways. There are now a total of 35 templates to choose from. Add a freeform table to your forms for quick list tracking. Create a quick to-do list, shopping list, or keep track of gifts received at birthdays and weddings. Save space in your Libraries pane by grouping like libraries in a single folder. Export the entire folder as a group of templates for easy sharing and uploading to the Bento Template Exchange. Export data from all of the libraries at once into separate CSV, Tab delimited, Excel, or Numbers files. Change the icon for any library, choosing from the list of available icons. Resize your library icons to display either large size or a more compact size to save space in your Libraries pane. Add a static image, such as a team logo, to any of your forms. The image appears on all records in the library automatically. Protect your valuable data with new security options. Use the new field type called “Encrypted” to store sensitive data, like web site logins and banking details. Assign a sharing password to allow others access to your shared libraries. This password is different from the database password and only allows access to specific libraries that you have chosen to share over a local area network. Keep your team informed and up-to-date. Share your Bento libraries with up to 5 other Bento users on your wired or wireless local area network. Choose to share your entire Bento database or selected libraries. Add a sharing password that prevents access to shared libraries by unauthorized users. Allow adding, deleting, and updating information or choose to limit access to viewing only so no changes can be made. Uses Apple Bonjour to automatically find shared Bento libraries on the same network. *Sharing requires each user to have their own copy of Bento, and a local area network using a wired or Wi-Fi wireless connection. *iCal events cannot be edited by others when sharing libraries. Get even more new features that you’ll wonder how you ever did without. Select the email addresses that you’d like to send to in Table view, then choose ‘Email Selected Addresses’ from the Edit menu. Apple Mail opens, creates a new message, puts the selected email addresses in the ‘To:” field and leaves the cursor in the Subject field so you can complete the group email. Browse, try, and apply themes more easily than in previous versions. Print a blank version of any form, great for surveys and sign up lists. Now you can copy forms within a library and between collections–a huge time saver and great way to keep things consistent throughout your libraries.